Cafeteria Trays – Food trays are often used for several lunches, but are rarely cleaned between each use. They are handled by a high volume of students each day, exposing the tray surface to a variety of harmful germs. Art Supplies – Paint brushes, markers, crayons and scissors are used daily by students, but are rarely disinfected. Considering the flu virus can live on a hard surface for up to 24 hours, these materials can easily pass germs from student to student. Backpacks – From the bus floor, to the classroom floor and sometimes the locker room. Backpacks are a hot spot for bacteria, picking up germs everywhere your child takes it. They are rarely washed and get brought back into your home each day after school. Keyboards/Tablets – Many schools today use technology as a learning tool in the classroom. Tablets, keyboards and computer mice are passed from student to student, but are not included in a daily cleaning program. 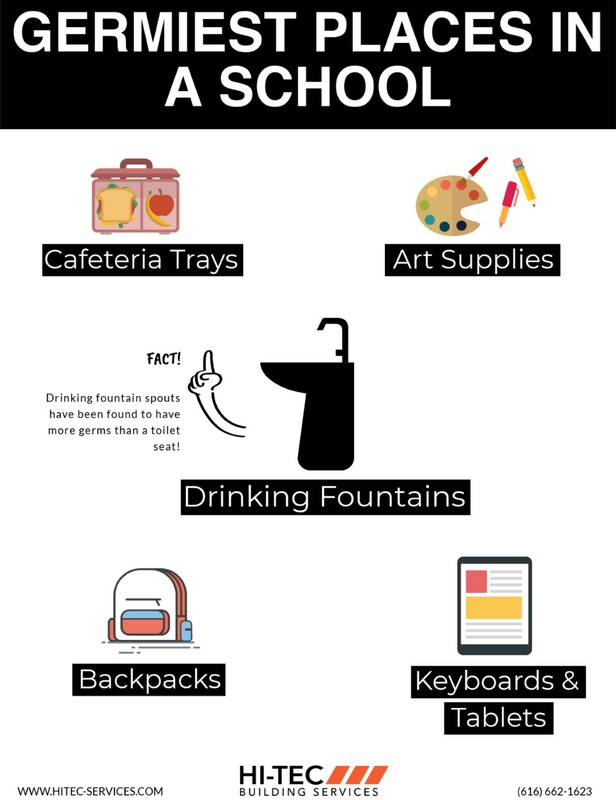 Drinking Fountains – One of the germiest places found in a school is the spout of a drinking fountain. It’s common for kids to touch their mouth to the spout – directly picking up any germs left from the child that went before them. Did some of these areas come as a surprise to you? Contact us today for tips and instructions on how to properly disinfect any hard surface.